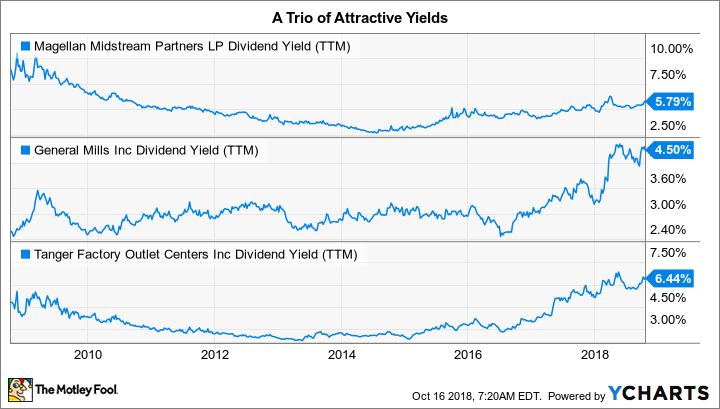 If you like to collect dividend checks, then you'll really love these three long-time dividend stocks and their high yields. If you are a devoted dividend aficionado, there are probably few thrills as exciting as seeing a dividend payment hit your brokerage account. It's even better when the dividend is a big one! You'll get more of those good feelings if you add high-yielding Magellan Midstream Partners, L.P. (NYSE:MMP), General Mills, Inc. (NYSE:GIS), and Tanger Factory Outlet Centers, Inc. (NYSE:SKT) to your income portfolio. Here's why you might want to buy each of these companies today. Magellan offers investors an impressive 5.8% yield. The distribution has been increased every single quarter since the master limited partnership came public in 2001, bringing its annual streak to 18 years. The average annual distribution increase over the past decade was around 10%, with the company targeting hikes of as much as 8% over the next several years. If you're looking to add some high-yielders to your portfolio, Magellan's stats are worth a very close look. However, there's more to like here than just these distribution stats. For example, Magellan's midstream energy business is largely backed by fee assets, providing a steady income stream to support distributions. And it is conservatively run, with low levels of leverage (debt to EBITDA is roughly 3.5 times, at the low end of its peer group) and tends to avoid issuing dilutive units (a common practice in the midstream space). Moreover, distribution coverage is targeted at roughly 1.2 times -- ample safety for the payout. All of this remains true even though investors appear to have soured on the midstream sector, a fact highlighted by the increase in Magellan's yield from around 3% in 2014 -- driven by a nearly 30% unit price decline. Despite the price drop, Magellan's growth hasn't stalled at all. Here it is focused on ground-up construction with customers waiting in the wings, or expansions at facilities where customer demand demonstrates a need for additional investment. It currently has $2.5 billion worth of projects lined up. That spending backs the partnership's distribution growth projections. If you are looking for a high and sustainable yield from a conservatively run midstream partnership, Magellan should be high on your list. General Mills' dividend yield is currently 4.5%, the highest it has been since the mid-1990s. The dividend has been increased each year for 14 consecutive years. The average annualized dividend increase over the past decade was nearly 10%. The company's name is relatively well known and you definitely know some of the products it sells, including Cheerios, Haagen Dazs, and Yoplait. Right now, investors are worried about the fast-changing tastes of consumers, who are favoring fresh and healthy over the typical packaged food that people associate with General Mills' business. That's one of the key reasons for the historically high yield. However, this over 100-year-old company has changed with the times before, and it's doing so again today. For example, it has bought its way into the healthy space with acquisitions like Annie's, Lara Bar, and more recently, Blue Buffalo pet food (a move that expanded its reach into a new product segment). It has also been reworking older brands, notably with new yogurt and ice cream products. Simply put, General Mills isn't sitting still. Results are starting to show up, too. For example, General Mills gained market share in eight of its nine core segments in the fiscal first quarter. And with the addition of fast-growing Blue Buffalo, the company is hoping to see sales growth tick higher in the years ahead. MMP Dividend Yield (TTM) data by YCharts. To be fair, there are reasons to be concerned. Although history suggests that General Mills will adapt, the Blue Buffalo acquisition was expensive (some market watchers believe the company overpaid), and a company as large as General Mills takes time to shift gears. So, there's not likely to be a magic bullet to bring relief from current headwinds, recently including input cost inflation and spiking transportation expenses. Long-term investors, though, can take advantage of the pessimism, here, and pick up a high yield from a company that's proven it can withstand the tests of time. As the ancient proverb goes, this too shall pass. Tanger Outlet Center's yield is 6.5%, higher than it was at the depths of the 2007 to 2009 recession. The dividend has been increased each year for 25 consecutive years, and the average increase over the past decade was roughly 6.5%. So far, so good for dividend investors. The big problem is that Tanger is a real estate investment trust, or REIT, that owns retail properties. With Sears Holdings just filing for bankruptcy protection, the overblown retail apocalypse story is rearing its ugly head again. There's good reason to be fearful when it comes to lower-quality enclosed malls, but Tanger doesn't do enclosed malls at all; it owns and operates a portfolio of 44 outlet centers. There are no anchor tenants to worry about, and operating costs are lower. That said, bankruptcies have indeed hit the REIT's occupancy level, which has trended steadily lower since peaking in 2013. But the drop is from 99% to roughly 95%, hardly a disastrous event. While discussing second-quarter results, meanwhile, the company noted that leasing activity had taken an encouraging turn in the quarter, suggesting that the worst of the impact from bankruptcies may be over. And for those lessees that are still struggling, Tanger has shown a willingness to offer temporary rent concessions to maintain occupancy at high levels, a move that is good for the tenant and for the REIT, since it helps keep shoppers coming to its properties. Meanwhile, Tanger's finances are rock-solid. Dividends are expected to represent a very modest 60% of its funds from operations, a key performance metric for REITs, in 2018. Even if the REIT faces continued headwinds it should have little trouble supporting its dividend. Further, it has an investment-grade balance sheet and covers interest expenses by more than five times. All in, there's no reason to think this outlet center REIT is in financial distress. It looks more like it's getting lumped in with mall REITs that simply aren't comparable. Long-term investors willing to ride out the uncertainty in the retail landscape with a financially strong company that's actually weathering the storm rather well should take a close look. When it comes to finding high-yield stocks in today's market, you often have to delve into areas that are out of favor. That includes the midstream, packaged food, and retail spaces. However, if you dig a little into these areas, you can find diamonds in the rough. Conservative Magellan is using the same boring playbook it always has and is rewarding investors along the way. General Mills and Tanger are facing notable headwinds, but each is capably working through the troubles, as they have done before. Income investors willing to be greedy when others are fearful should like what they see here.